The "first drive" reviews of the new 2015 Volkswagen GTI have been trickling out as of late, and if they're to be believed, the car is good. Like, really good. Like maybe the best thing since sliced bread. 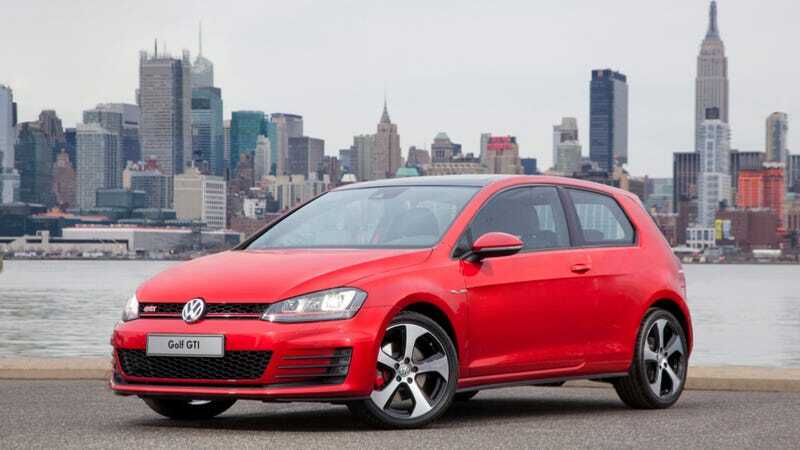 Sadly, us Americans won't be getting the MK7 Golf or its GTI variant until summer of 2014, so it's going to be a long wait. But great things come to those who wait, and apparently, this GTI is not only the best version ever, but maybe the best hot hatch currently on the market. The engine remains a 2.0-liter turbo four, but power has been bumped to 210 horsepower (220 with the performance pack) and 258 pound-feet of torque, and the car has a whole host of electronic goodies to keep those front wheels from going too crazy. The car is bigger than the MK6 but also lighter. Reviewers say stability control still can't be fully defeated (barf) but it sounds less intrusive here. We'll see about that. Jalopnik has not had a chance to get behind the wheel yet. I'm sure that will happen at some point, but for now, the best I can do for you is round up several other reviews so you can see for yourself. Hot hatches are fun because they're practical, more-or-less affordable to working stiffs like us, and they exist in a field with a lot of competition. We'll have to see how this car stacks up against the Focus ST and the getting-older-but-still-excellent Mazdaspeed3. There's also the Fiesta ST, which is smaller and cheaper, but may be enough of a hoot to lure away potential buyers. Without further ado, here's the GTI reviews. Feel free to add ones you've read in the comments as well. The all-new Mk7 GTI is a giant slayer: It’s easily the best GTI ever in terms of driving dynamics. VW says it’s the fastest, most powerful, and most efficient ever, and that’s just half the story. The fun has remained intact, but a new level of chassis composure and speed is laid on top of VW’s best car. Also, I think it’s great looking. [...] The optional (for Europe, likely for us, too) Performance package adds upgraded brakes sized similarly to those on the last-generation Golf R, 10 hp more (from revised engine controls), and of chief importance: an electronically controlled mechanical limited-slip differential. The Performance package gives the GTI otherworldly traction—think halfway between a regular front-wheel-drive car and an all-wheel-drive car—in the dry at least. It rockets out of corners with no drama, no wheelspin, and (here’s the most impressive part) no torque steer. None. And yet the steering still manages to have some feel. Wow. You might also notice we're talking a lot about the Performance Pack. It's something that will be offered in the U.S. GTI, although pricing, and exactly what's included, are still on the table. We know it'll wrap together the active-diff system, brake upgrade, and a few other items—although it might or might not include the summer-performance tires our test cars were fitted with. Variable damping is also a wild card, and could affect general refinement when it lands on these shores. In any case, we think this package, which will likely cost less than $2,000, will be the way to go. Without the Performance Pack, the 2015 GTI gets by with an all-electronic e-diff system, essentially leaving torque-transfer duty to the brakes. It's likely you'll want to check that box if you have track driving in mind. Die-hard GTI fans may consider the seventh generation of their beloved hatchback with skepticism. But settling into the supportive driver's seat for a quick spin will ease any reservations. From its crisp, reactive steering to its eager engine and solid chassis, this latest iteration feels just like a GTI should. With an interior that's both reassuringly spartan and surprisingly premium, the 2015 Volkswagen GTI retains the spirit of the original while offering more performance and comfort than ever before. How's it drive? Better than ever, in even more refined fashion. Compared to today's GTI, still a damn good car, the new one pretty much seems a class above. It's smoother and quieter and more solid but the refinement doesn't cut into athleticism. For starters, the 2015 is pleasing in the tactile sense, in nearly every respect. Its clutch operates nice and easy. Its brake pedal is sensitive but quickly mastered. The dead pedal is perfect. Its shifter is a bit softer than we might like, but not drastically so. The gear ratios have changed, probably to improve fuel economy, but acceleration is stronger than ever thanks to the slightly lower and broader torque peak. The new GTI feels quicker, absolutely, and while it might be a bit less revvy, it has substantially more torque throughout the rpm range. The thrust presents itself as a nice kick in the stomach off the line with either the manual or the DSG automatic. We'd call it fast, though anyone who remembers the 90-hp Mk1 in 1983 will laugh because they probably thought that was fast, too. In comparison to early GTIs, understeer doesn't occur in this one. In the real world, the refinement makes the GTI far more attractive than the Focus. The new seats are the best to ever grace a Golf — I am including Golf Rs, Anniversary editions, and even Trophies for you old-schoolers out there. The steering wheel is still one of the best in the industry, and how can you not like a golf ball shift knob? The trunk opening is wide and low cut, meaning it will be easy to fill the giant hatch with all the stuff, which is why you wanted a hatch to begin with, right?